00:40:00 Makes 6 servings, 1/6 recipe (311 g) each. Makes 6 servings, 1/6 recipe (311 g) each. Add a kick of flavour to your shepherd's pie with our BULL'S-EYE Guinness Draught Beer Blend Barbecue Sauce. 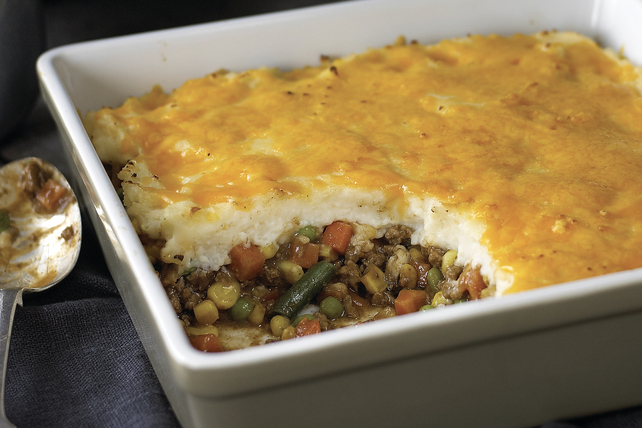 Our BULL'S-EYE Shepherd's Pie owes its awesome flavour to this savoury sauce - although the cheesy garlic mashed potatoes don't hurt! Brown meat in large skillet; drain. Stir in frozen vegetables and barbecue sauce. Spoon into 9-inch square baking dish. Mix potatoes, cream cheese, 1/2 cup cheddar and garlic until well blended. Spread over meat mixture; top with remaining cheddar. Prepare as directed, omitting the garlic and substituting 3/4 cup Kraft Original BBQ Sauce mixed with 1/2 tsp. onion powder for the 6 Tbsp. Bull's-Eye Barbecue Sauce. This recipe is a great way to use leftover mashed potatoes. Save 60 calories and 8 grams of total fat, including 4 grams of saturated fat, per serving by preparing with extra-lean ground beef, Philadelphia Light Brick Cream Cheese Spread and shredded Cracker Barrel Cheddar Cheese Light - Made with 2% Milk. Serving Size Makes 6 servings, 1/6 recipe (311 g) each.